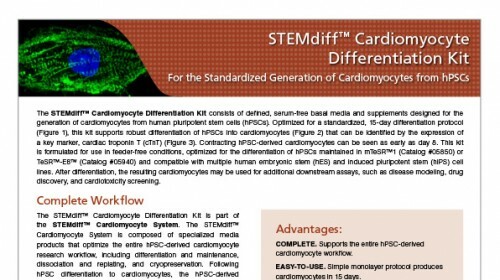 STEMdiff™ Cardiomyocyte Differentiation Kit (Catalog #05010) includes a medium for differentiation of human embryonic stem (ES) and induced pluripotent stem (iPS) cells (human pluripotent stem cells [hPSCs]) into cardiomyocytes (cardiac troponin T-positive [cTnT+]), as well as a medium for maintenance of hPSC-derived cardiomyocytes. 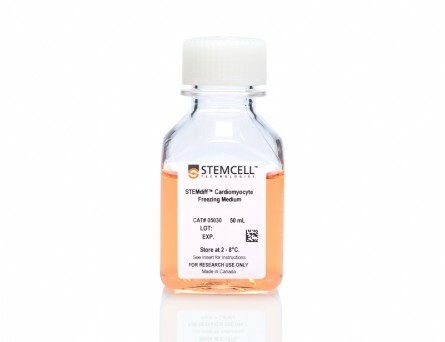 This kit can be used to generate cardiomyocytes derived from a clump culture of hPSCs maintained in mTeSR™1 (Catalog #85850) or TeSR™-E8™ (Catalog #05990). 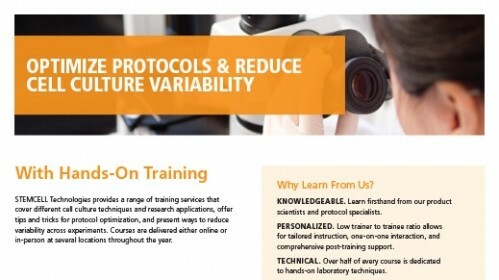 Greater than 80% of these cells will be cTnT+. An average of 1 x 10^6 cells can be harvested from a single well of a 12-well plate. 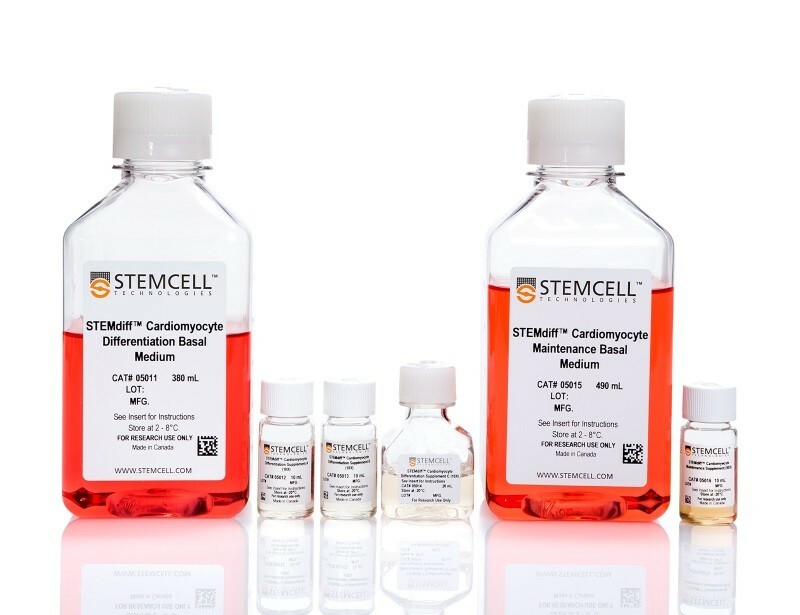 STEMdiff™ Cardiomyocyte Maintenance Kit (Catalog #05020) can be used for long-term maintenance of hPSC-derived cardiomyocytes for one month or longer. 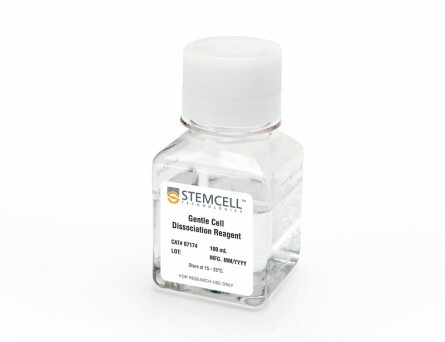 These cardiomyocytes can be used in various downstream applications and analyses. 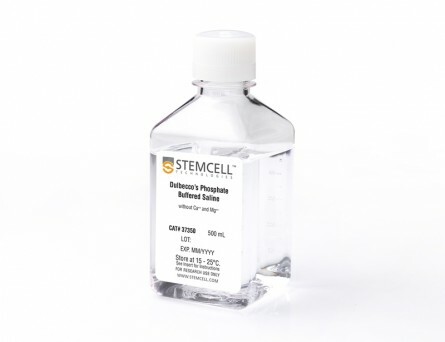 Two days before the differentiation protocol, hPSC colonies are harvested and seeded as single cells at 350,000 cells/well in a 12-well format in mTeSR™1 or TeSR™-E8™. After one day (Day -1), the medium is replaced with fresh TeSR™ medium. 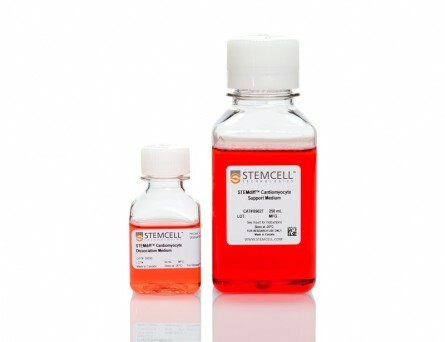 The following day (Day 0), the TeSR™ medium is replaced with Medium A (STEMdiff™ Cardiomyocyte Differentiation Basal Medium containing Supplement A) to begin inducing the cells toward a cardiomyocyte fate. 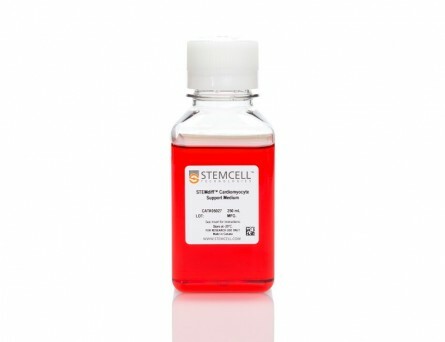 On day 2, a full medium change is performed with fresh Medium B (STEMdiff™ Cardiomyocyte Differentiation Basal Medium containing Supplement B). 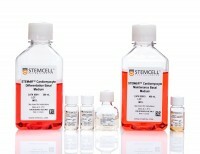 On days 4 and 6, full medium changes are performed with fresh Medium C (STEMdiff™ Cardiomyocyte Differentiation Basal Medium containing Supplement C). 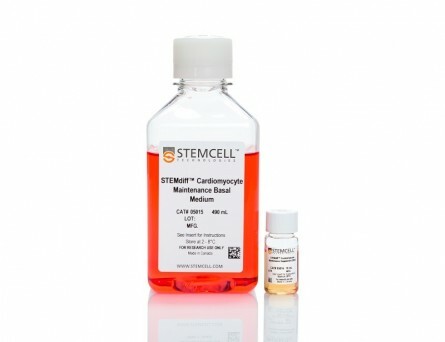 On day 8, medium is switched to STEMdiff™ Cardiomyocyte Maintenance Medium with full medium changes on days 10, 12 and 14, to promote further differentiation into cardiomyocyte cells. Small beating areas of cardiomyocytes can be seen as early as day 8, progressing to a full lawn of beating cardiomyocytes that can be harvested as early as day 15. Representative images of (A) hES (H9) cells and (B) hiPS (WLS-1C) cells on day 15 of differentiation to cardiomyocytes using the STEMdiff™ Cardiomyocyte Differentiation Kit. Differentiated cells exhibit typical cardiomyocyte morphology as an adherent, tightly packed web-like monolayer of beating cells. 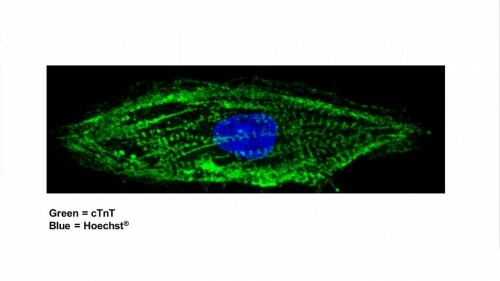 (C) Representative confocal microscopy image of a single hPSC-derived cardiomyocyte generated with the STEMdiff™ Cardiomyocyte Differentiation Kit and stained with cTnT (green) and DAPI (blue). 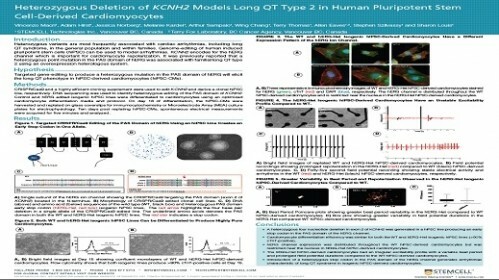 hES and hiPS cells were cultured for 15 days in single wells of 12-well plates using the STEMdiff™ Cardiomyocyte Differentiation Kit. 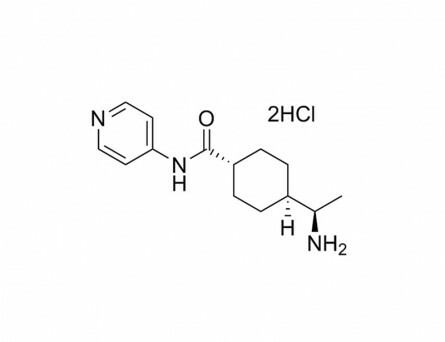 At the end of the culture period, cells were harvested and analyzed by flow cytometry for expression of cardiac troponin T (cTnT). 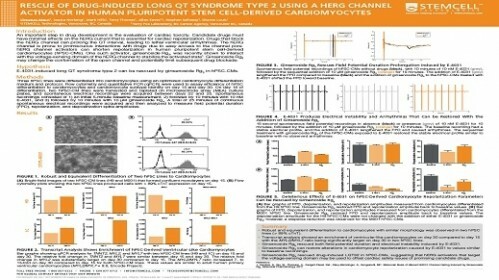 (A) Histogram analysis for cardiomyocyte cell marker cTnT for cultures of hES (H9) and hiPS (WLS-1C and STiPS-M001) cells. 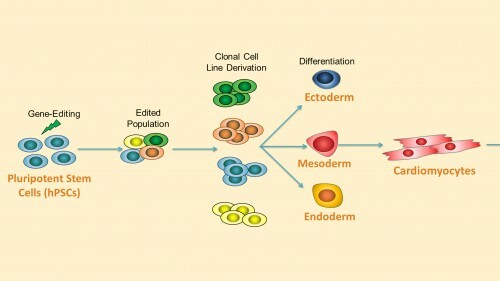 (Filled = sample; blank = secondary antibody only control) (B,C) Percentages and total numbers of cells expressing cTnT in cultures of hES or hiPS cells are shown. Data shown as mean ± SEM; n=3. 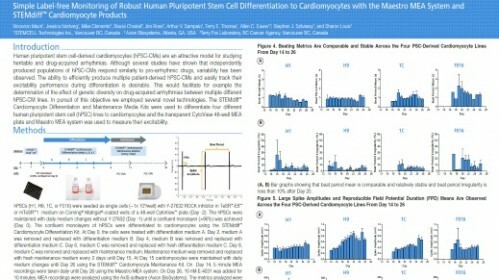 Microelectrode array (MEA) voltage recordings of cardiomyocytes (day 27) derived from human pluripotent stem cells generated and maintained with the STEMdiff™ Cardiomyocyte Differentiation and Maintenance Kits. 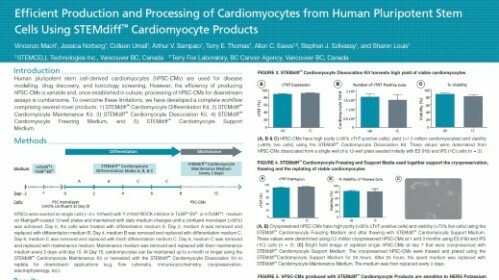 The hPSC-derived cardiomyocytes have a characteristic electrical profile and stable beat rate. A large depolarization spike followed by a smaller repolarization deflection is observed.